There is an old saying that all good things must come to an end. That is never more true than in the stock market where rallies always end and they always seem to end too soon. The Dow has posted a gain for eight consecutive days. This streak of gains will eventually come to an end and hopefully sooner rather than later. The sooner we have a day or two of profit taking the sooner we can get back to the next string of gains. The Russell did that today. The index traded within one point of a new intraday high and 4 points over its record closing high. However, today was not the day and the strongest index for the month of May ended with a -6 point loss. Resistance won for another day. I am not predicting a specific market decline. It is simply time for the market to rest after nearly two weeks of gains. We are however in the final stages of the Q1 earnings cycle and post earnings depression is alive and well. You could not tell it from the market gains over the last week but it could rear its ugly head at any time. We are also in the "Sell in May and go away" period which begins the six worst months of the year for the market. The summer doldrums are just a few weeks ahead starting with Memorial Day. There are a lot of factors working against the market but there are recorded instances of summer rallies. Because they are unexpected, there is normally a lot of short covering. Should one appear, it could be fun. 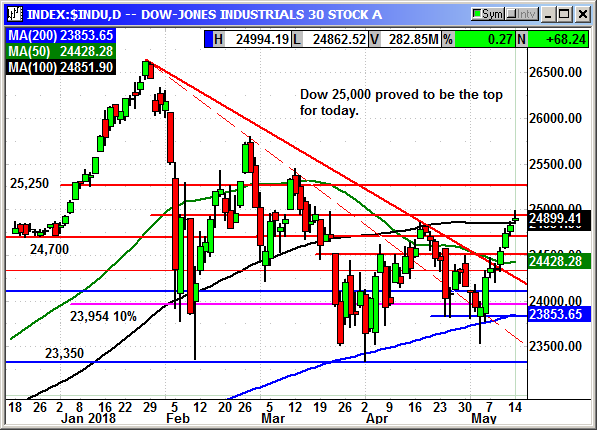 The Dow ran into resistance at 25,000 again on Monday. This has been a hurdle since it was first crossed in early January. We have traded on both sides, many times but we have not touched it since March 16th. A break over that level would trigger some price chasing. We hit 24,994 intraday before the Dow gave back 92 points to close with a 68-point gain. Boeing and UnitedHealth were again the big winners. 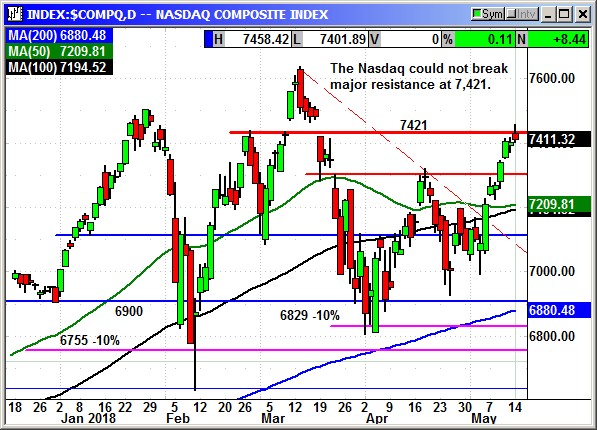 The Nasdaq tried hard to break through the resistance at 7,421 but was unsuccessful. The intraday high was 7,458 for a nice 55-point gain but it did not hold and the Nasdaq was fortunate to hang on to 8 points at the close. Resistance held once again. The big cap tech stocks were slightly weighted to the positive side. The S&P was up +14 intraday but gave it back to close barely positive. 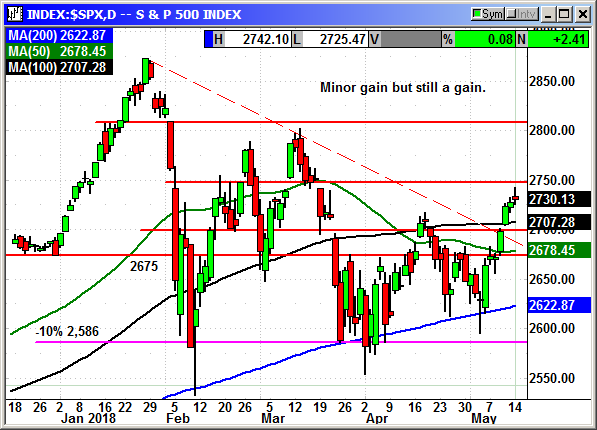 The index did not reach resistance at 2,750. The chart is improving but it has not yet shifted to bullish. This is still just a lower high in the four-month pattern. 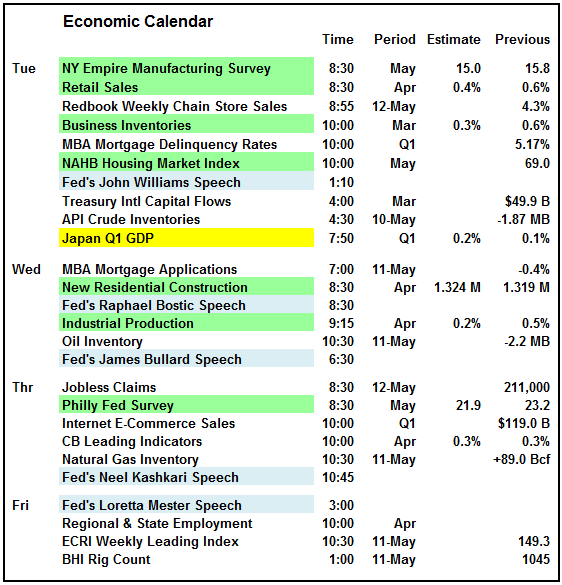 We have a busy calendar for Tuesday with the retail sales and housing index. The Japanese GDP is also important for a global sentiment and fiscal policy view. There are three Dow components reporting earnings this week. Home Depot reports before the open on Tuesday. This will provide direction for the Dow and their report is expected to be good. Earnings consensus is $2.06 with $25.23 billion in revenue. During the day I did not seen anything material impacting the market. The software sector was the hardest hit in the afternoon selling but everything else appeared to remain relatively stable. When I was writing a couple hours after the close and the S&P futures were mildly negative, I said I did not see anything other than some simple profit taking. As I write this now the futures are down -4.50 on the large number of injuries and deaths in Israel. At least 37 Palestinians were killed and more than 900 wounded in the border skirmish with protestors over moving the U.S. embassy. There are a lot of factors working against the market but the 25% earnings growth in Q1 and 22% expected for the rest of the year is a powerful antibiotic against those ills. I would remain cautious until the Dow closes above 25,000 and the Nasdaq above 7.425. 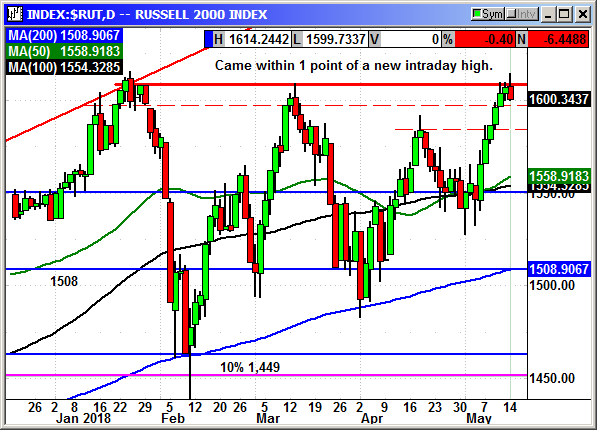 Having the Russell above 1,615 would be a great motivator for the broader market. 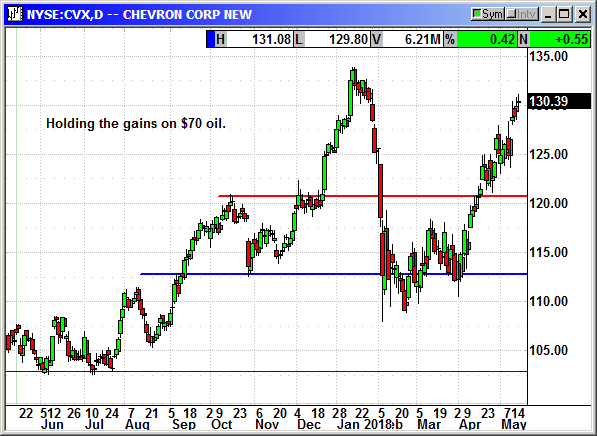 Buy July $57.50 call, currently $2.51, initial stop loss $47.65. Major gain for the week after the CEO and Founder, Tom Leighton answered an acquisition question positively. An analyst asked him if the company was for sale and he said, "We are a public company and our board, which is very professional and diligent, is always going to do the right thing for shareholders." That suggests if they are not considering any offers today, they will more than likely be receiving some in the near future. Shares exploded higher. 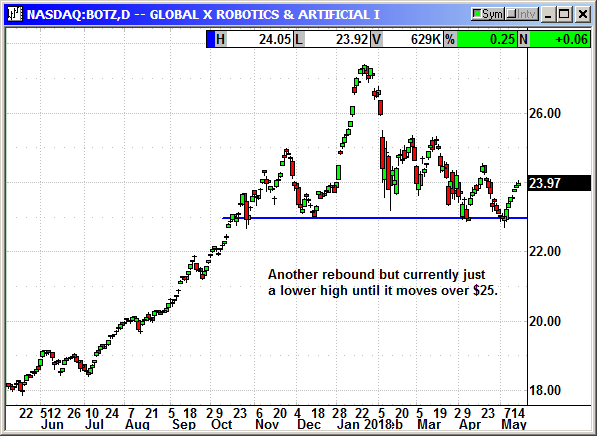 BOTZ is rebounding but it is likely to expire worthless if the rebound does not accelerate soon. 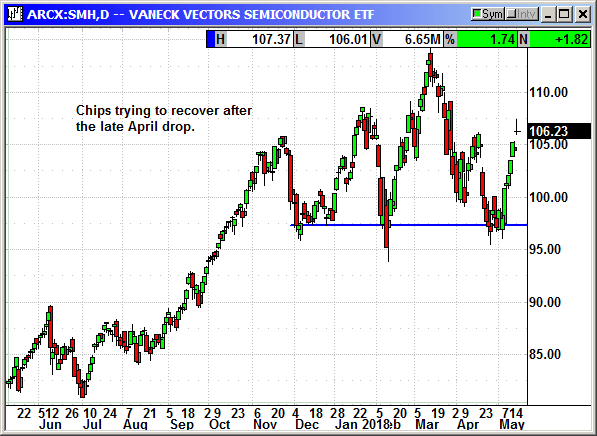 The last drop in the chip sector killed the momentum and deflated the premium. If Nvidia were to catch fire again we might have a chance. 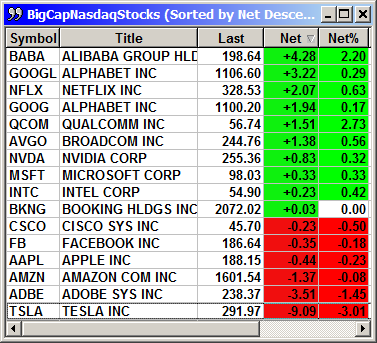 Long June $26 call @ $.90, see portfolio graphic for stop loss. No specific news. Shares have been rebounding strongly and helping to lift the Dow to 2 days of gains. Currently testing resistance at $156. We have a long way to go on this option as well. We need CAT to move back over $160 to recover the premium. 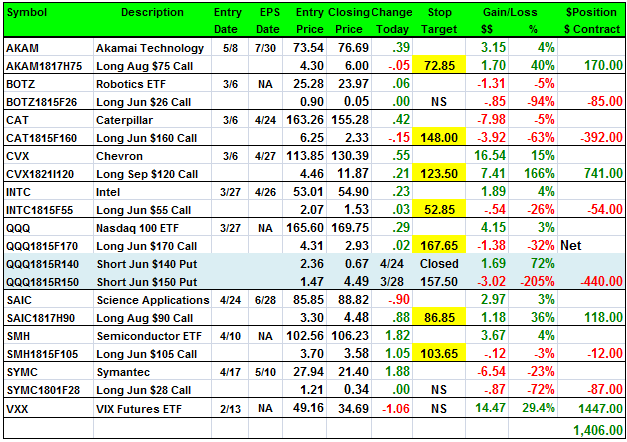 Long June $160 call @ $6.25, see portfolio graphic for stop loss. No specific news. Shares are almost at a new high on $70 oil. Long Sept $120 call @ $4.46, see portfolio graphic for stop loss. Shares have been moving up steadily after Qualcomm said it was getting out of the server chip business. No specific news. 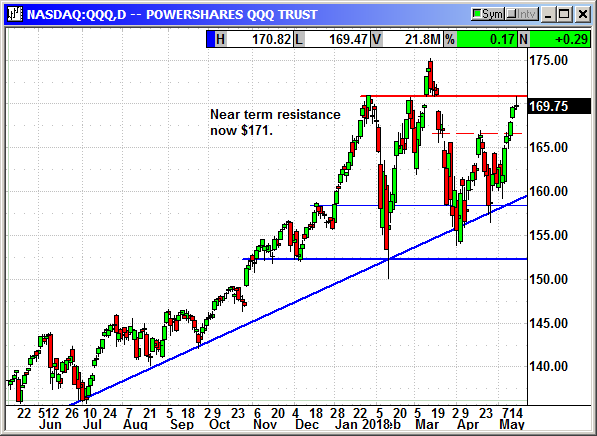 Strong rebound in the Nasdaq but the QQQ has to move over $171 to rescue this position. The last dip in April erased the majority of the premium but it is clawing back. PowerShares QQQ, formerly known as "QQQ" or the "NASDAQ-100 Index Tracking Stock", is an exchange-traded fund based on the Nasdaq-100 Index. The Fund will, under most circumstances, consist of all of stocks in the Index. The Index includes 100 of the largest domestic and international nonfinancial companies listed on the Nasdaq Stock Market based on market capitalization. The Fund and the Index are rebalanced quarterly and reconstituted annually. The Nasdaq crashed along with the Dow but did not retest the February lows. The Nasdaq actually set a new high two weeks ago before the second drop arrived. 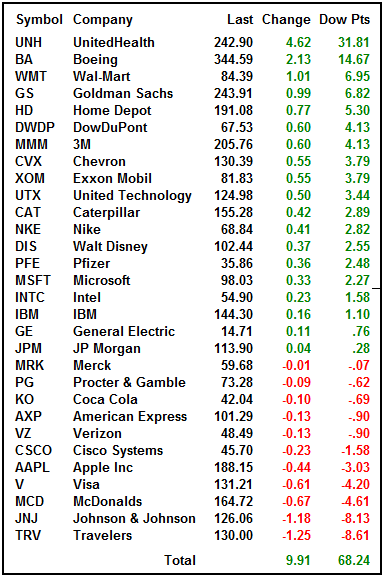 The tech stocks led out of th einitial correction and I believe they will lead through the Q1 earnings cycle. Even though the Nasdaq gained 3% on Monday, there could be a lot more to go and the index should make another new high before the Q1 earnings cycle is over. I am going to offset the call with an optional short put to reduce our cost significantly just in case the expected rally does not appear. 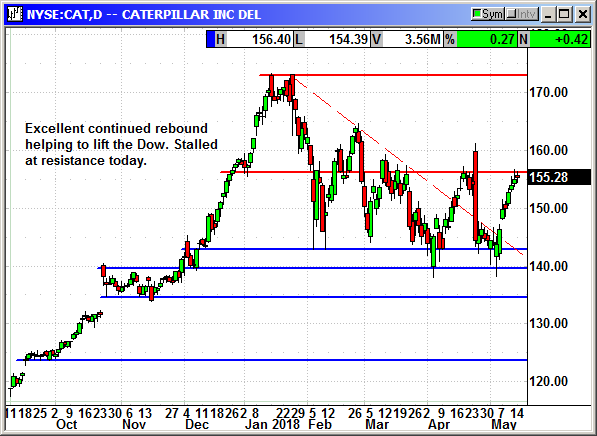 Long June $170 call @ $4.31, see portfolio graphic for stop loss. 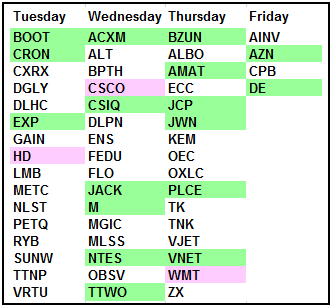 Closed 4/24: Short June $140 put @ $2.36, exit .67, +$2.69 gain. 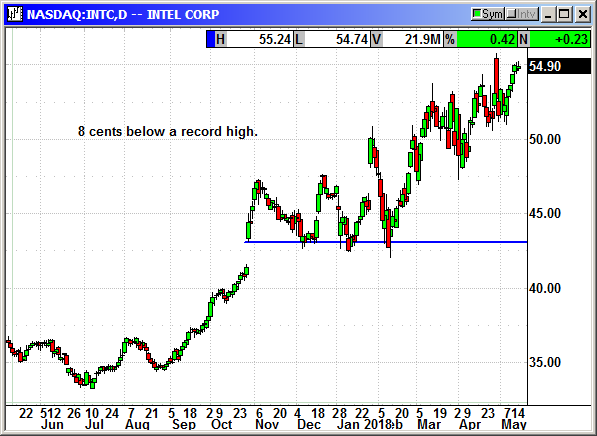 Previously Closed 3/28: Short June $150 put @ $1.47, exit $4.49, -3.02 loss. No specific news. 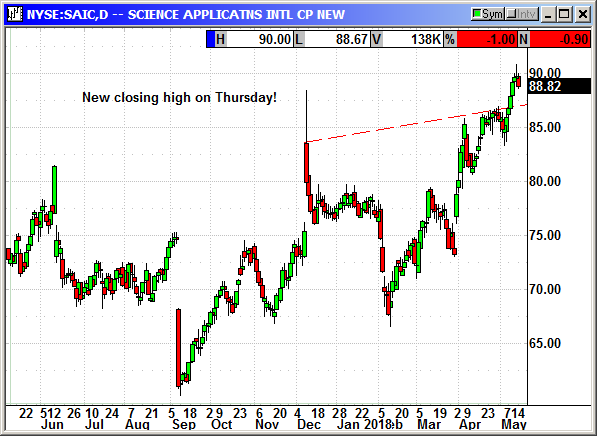 New closing high on Thursday. SAIC is making waves in the military procurement arena. The previously sectored company was limited in the services it offered but that has changed in recent years. For instance they are now one of two surviving bidders to produce a floating tank. An Amphibious Combat Vehicle (ACV) for the Marine Corp. This is remarkable because BAE has supplied all amphibious vehicles for the Marines since 1941. The competition began with 5 companies building 16 prototypes. BAE and SAIC entered the second round and were awarded $100 million and 18 months to build 16 prototypes by June 2017. The winner of the competition gets a $1.2 billion contract to deliver 204 vehicles by 2020. This is just one example of SAIC successfully branching out in to other areas of military procurement. With $700 billion in military funding passed and the money being spent, there are going to be a lot of contracts doled out over the next several months. For Q4 they reported earnings of $1.16 compared to estimates for 81 cents. Revenue of $1.13 billion beat estimates for $1.07 billion. Earnings are expected around June 28th. Shares spiked to $86 on earnings and then pulled back for a couple weeks in the struggling market. 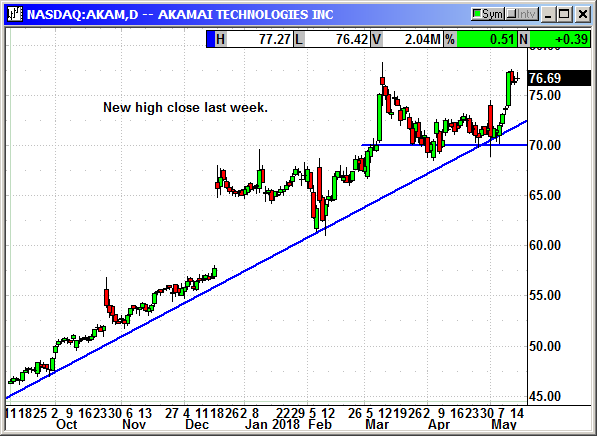 Over the last week they have returned to $86 and appear ready for a breakout. 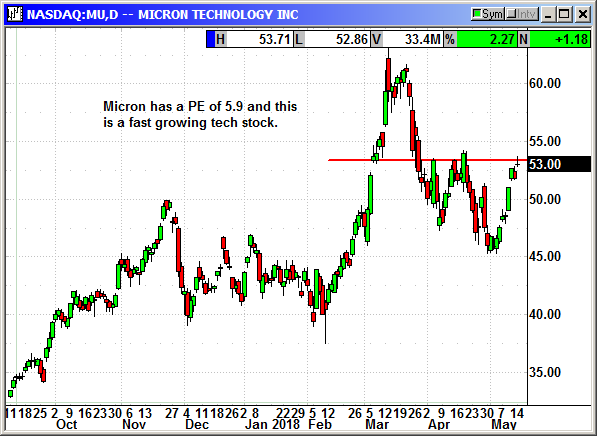 Long Aug $90 call @ $3.30, see portfolio graphic for stop loss. The sector is trying to rebound after the late April drop inspired by Apple. Nvidia has not sold off materially after earnings and a positive market will probably pull investors back into that stock. 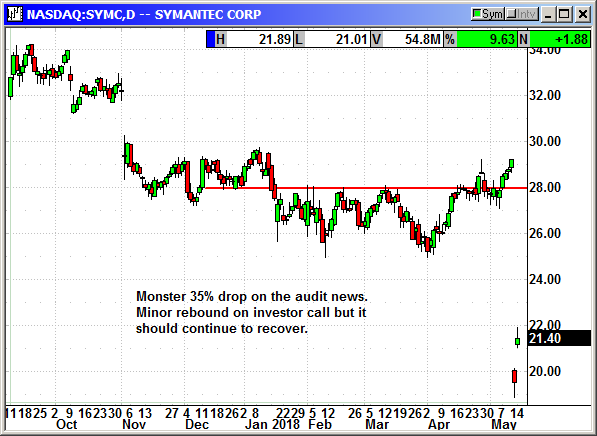 Symantec was a major disaster last week. Fortunately, the option was cheap. They posted mediocre guidance and disclosed an internal audit. The stock fell -35%. On Monday the company held an investor call and gave some more details saying it would not likely impact past earnings. There were fears there would be a restatement. The company also firmed up revenue and margin forecasts for 2019 and 2020. Shares rebounded 10% on the news. Buy Oct $24 call, currently $1.65, stop loss $18.65. Shares have been fighting resistance at $28 since early January. I believe a breakout is imminent. 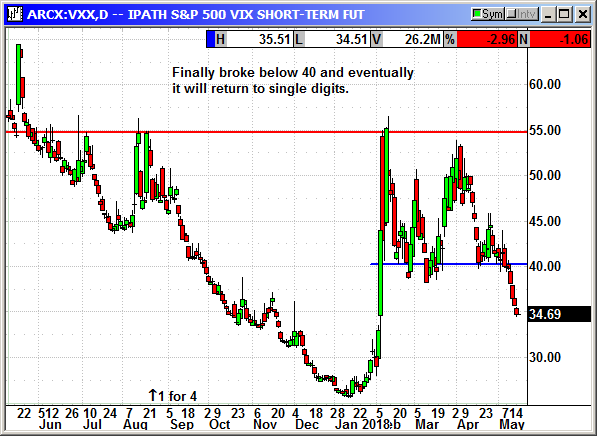 Volatility is collapsing and the VXX broke below support at 40. It is finally moving in our direction.